These days, it’s important to have a basic understanding of what goes into great design. Whether that happens to be a billboard, business card, or an app icon, great design can be found everywhere if you know what to look for. I’ve found that analyzing the work of other brands improves my own design eye, and helps me keep up with current industry trends. After you read this, you’ll be able to tell someone whether something looks good, or bad, and why! Before we dive in, we only need to ask one question of the design, and everything else follows right suit. 1. Does it fulfill it’s basic purpose? In essence, design is nothing without function. What is the design trying to accomplish? What is it helping the viewer do? “Good” design will always be solving someone’s problem. In moments like finding the right train stop on a big-city map, helping a company win a big client, or ordering Chinese food from a menu, effective design becomes increasingly crucial. Ask yourself, “What problem did this design solve?” Even if the design’s purpose is to draw people in, or even grab their attention and raise awareness about a topic, that's ok too. Good design has purpose. Now that you’ve determined it’s purpose, you can look at a few other elements. 90% of the time, good design is easy to read. Can your brain scan it and understand it at the same speed? Or do you need to stop and take the time to figure it out? Did you get what you needed from it? Less is more when it comes to words, especially in design. Next, let's take a look at the spacing. There should be enough space between each of the elements, so that the design can “breathe.” That includes individual letter spacing (“kerning” or “tracking") and the space between each line of text (“leading”). No one wants to read lines of text smashed together all over a magazine ad, unless you’re Nancy Drew looking for clues. Text should have room to be “free,” away from the very edges of whatever it is sitting on, and room to lead the viewer’s eye to the next element. Good design should only contain a variation of 2 fonts or less, simply for the readability. Good design usually has some bigger “in-your-face” text, and then a subhead of some sort, that is smaller and easy to read. The bigger font can be crazier, but the subhead provides some context support. If you look at this graphic, it has a big header, and then a simpler subhead. Both are large enough to read, and one overpowers the other on purpose. The header grabs the eye of the viewer, and the subhead gives it some explanation. Some script-like fonts are hard to read, and are not meant to be used all over a design. If you see this, it’s either not made by a professional, or it’s sporting a vintage-1800’s feel on purpose. Ah, another artsy term. Contrast. Our brains actually rely on contrast to help us make everyday decisions, and even primal decisions. If you were to see a brightly colored snake, or spider, those colors generally mean poison, or danger! In the same way, our eyes are attracted to contrast with color and light. Without either of those things, something can be more easily overlooked. Pop chips recently released a campaign with simple, bright colors, featuring Katy Perry holding their product. This is a great example of contrast, and color together. Contrast can also be defined by how the colors themselves fit together. When see designs using complimentary colors, (like blue and orange) or maybe primary colors (like red, blue and yellow), each of those color sets pair together very well, and create something pleasing to look at. Lastly, good design is usually highly relatable to the viewer. When you see good design, it should have one basic message that you get from it. Since we are surrounded by messaging, and advertising, it’s easy to ignore the design revolving around 'buying' a product. But, if you’re inspired by a story from a customer, or a picture of the product at the right time and place, those two experiences can change how you relate to a brand, and when you think of that product. For example, a billboard advertising a new urgent care facility, with a picture of a happy patient and a doctor, makes the billboard relatable and relevant to the viewer. The billboard suggests customer satisfaction, great medical care, and awareness of its new location. Overall, good design is relevant. Everything from images, text, and the messaging should be relatable to the viewer. Excellent use of color and fonts, always play into making great design. It’s more than Photoshop magic, and it’s just as valuable as any other form of communication, if not more powerful. 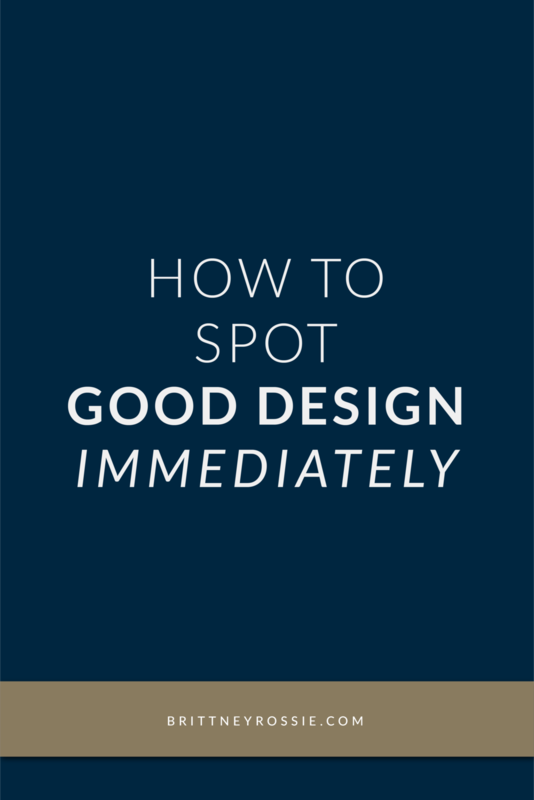 Now you know how to spot good design anywhere you go! With many different types and forms of design, these pointers can help you decipher what could be better in any situation. Whether it’s your own design, or the design or another company. Keep growing and keep observing! Where are some of your places to look for inspiration and great design?